Who is Everybody Drum and Ken Crampton? I often say we are born Artists and reborn Drummers! Ken Crampton is an Artist, Facilitator, Event Designer and Teacher has over 20 years experience in Building Community through the Rhythm and Arts. Ken has helped develop communities and events such as First Fridays (a monthly gallery hop), First Night Fredericksburg (founding member), The Drum Circle Facilitators Guild (founding director). Schools (pre through college), Libraries, Banks, Festivals, Church Retreats, Adult Care Facilities, and Corporations have all included Everybody Drum into their events as workshops, icebreakers or keynote presentations. Working with the various communities, we design successful programs that are fun, enlightening and exciting! Ken has trained with Arthur Hull, Babatunde Olatunji, Mamady Keita, Keith Terry, Kalani and Jaqui MacMillan and is a graduate of HealthRHYTHMS, Village Music Circles, and Drum Circle Music. What is an Everybody Drum Circle – Rhythm Event or Program? An Everybody Drum circle is a rhythm-based event where a diverse group of individuals and instruments are gathered for the common purpose of empowering a community with creative self expression in a group music making experience. Our Programs are infused with FUN, creativity and dynamic games, songs and various instruments! Why do we use Drums and Percussion and what are the benefits? A drum is a an instrument composed of a body or shell, usually hollow with a stretched membrane, or skin. This means it falls into the membranophone family, and can be traced back in time at least 4000 years ago. Though few ancient examples of the drum survived (being that they are often of perishable materials), evidence of its existence are represented in art adorning pottery, paintings, carvings, and cave paintings. Through out time, the drum has been an instrument used in celebrations, rituals, community building, entertainment, communication, healing, and to march troops into battle. Drums, like people come in all shapes, sizes, colors, and voices! So as a general classification, we can define drums into their physical shape then their cultural decent. Body shapes in the membranophone family include goblet, waisted, barrel, long, conical, cylindrical, footed, vessel, frame, and friction. The membrane is usually an animal skin, though synthetic are also used. The skin / membrane is attached four different ways, glued, nailed, pegged, or laced. The body or shell is composed of either wood, ceramic, metal, or synthetic materials. Sizes and shapes of drums vary as much as the diverse cultures that they hail from, again making the instrument as unique as the player. Sound is created by striking the membrane with hands, sticks, padded beaters or mallets. Basic sound made are the bass, tone, slap, flam, and muffed bass, tone, or slap. It is important to remember not to hurt yourself while drumming, removing rings from you fingers, keeping good posture, and remembering to relax and breath are essential. When playing music, it’s important to remember that you are not banging your instrument but making music with it… Group ensembles can consist of Aerophones (wind instruments), Idiophones ( bells, wood, shakers), Membranophones (DRUMS! ), and Chordophones (Stringed instruments). It is very important to Look, Listen, and Communicate when playing in an ensemble. So keep it fun, exciting, and above all enlightening! By Creative, Constructive, Dialog, we can all share the joy of a group music making endeavor! Types of Drums, goblet, waisted, barrel, long, conical, cylindrical, footed, vessel, frame, and friction. 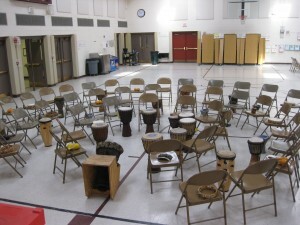 Where can we hold an Everybody Drum Circle – Rhythm Event or Program? From Conference rooms to the Classrooms Everybody Drum programs are designed with our clients needs and guidance. Contact Ken Crampton to discuss your needs! We provide all instruments! How long is does a program normally last? Programs normally run 45 minutes to 2 hours. We are available to fill any space from quickie ice breakers to rich interactive presentations and experiential learning. All programs are designed for specific clients needs – Please contact us! Fees and Costs are determined based on how many participants, length and details of program and travel costs. What are the logistics of an Everybody Drum Circle – Rhythm Event or Program? At Everybody Drum we can work with individuals to groups as large as 600 people! Chairs are generally set up in a circle or concentric circles. We ask that we have access to the location or venue at least 30-60 minutes prior to the program. Again Please contact Ken at Everybody Drum (540) 371-9040 for booking! Where Do I get Drums and Percussion for our Facility or Individual? For over 20 years Ken Crampton / Everybody Drum has been importing, constructing and selling drums and percussion! With our years of experience we have developed relations with musical instrument importers from around the globe! Call us today to design a program and or instrument kit for your facility or individuals!